Spirit is no stranger to controversy, and over the years has developed a marketing strategy built around edgy campaigns featuring tongue-in-cheek slogans and mascots. But with its latest campaign, the airline really plumbs the depths of poor taste. “Check out the oil on our beaches,” the ad implores. Images of bikini-clad women slathered in sun tan oil cascade across the background, accompanied by fares to beach destinations such as Atlantic City and San Juan, Puerto Rico. Click through to the sale page and you see an image of two bottles of sun tan lotion nestled in the sand. The bottles are green with yellow caps. One says “Best Protection 50 spf,” the other says “Best Protection $50 off coupon.” The B and P are highlighted, and obviously the green and yellow are taken from British Petroleum’s logo. We are excited to continue offering customers huge savings with specials like today’s offer promoting travel to our many beach destinations. The only oil you’ll find when traveling to our beaches is sun tan oil. There is so much garbage in this release that I hardly know where to begin. Mainly, the coupon is for all flights, not just those to areas affected by the oil spill. That means Spirit is exploiting sympathy for the affected regions as a means to drum up bookings to destinations like Atlantic City and Myrtle Beach. Spirit doesn’t even fly to the regions most impacted by the spill, such as the Florida panhandle or coastal Alabama and Mississippi. 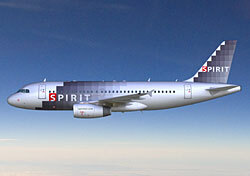 The closest a Spirit flight comes to the spill is Ft. Myers and Tampa. If Spirit weren’t a completely cynical, self-serving organization, it could have promoted flights to those cities alone and encouraged people to continue visiting the gulf. Further, people should be forgiven if they “misunderstand the intent,” because an ad featuring a slideshow of lotion-slick models is completely incongruent with the unfolding tragedy in the Gulf. The ad indeed conveys many things, but compassion for beleaguered Gulf Coast residents and the battered tourism industry there is not among them. The ad is tone deaf at best, and at worst blatantly makes light of the economic and environmental catastrophe in the Gulf. Lastly, the ad is not playing well, or Spirit wouldn’t have felt compelled to put out a release defending it. So why not just take it down? Why not say, “Hey, we were going for something edgy, but clearly we missed the mark. We’ve pulled the ad.” Spirit could even make a play for some goodwill with a better deal (and a more tasteful one) for its two Gulf Coast destinations, or by providing discounts to people heading down there to volunteer in the cleanup efforts. But Spirit clearly lacks the class or common sense for any of that. My opinion should be obvious by now: I think this ad is in astonishingly poor taste, and should never have seen the light of day. I’m not usually concerned with political correctness, but in my opinion Spirit’s ad crosses several lines.